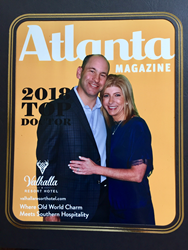 Atlanta-based plastic surgeon, Dr. Mark Deutsch of Perimeter Plastic Surgery, celebrated with his fellow doctors who were honored to be named “Top Doctors” in the July edition of ATLANTA magazine. The release party was held on Thursday, June 21, 2018 at the Atlanta History Center. Dr. Deutsch has over 20 years of experience in the plastic surgery field and is double board-certified by the American Board of Plastic Surgery. In addition to specializing in cosmetic surgeries such as breast augmentation, abdominoplasty, breast lifts, and liposuction, Dr. Deutsch regularly performs breast reconstruction for breast cancer patients. He also makes annual trips to South America to perform volunteer procedures in addition to his work in the United States. Perimeter Plastic Surgery (PPS) is one of the nation’s top plastic surgery practices. With locations in Atlanta and Fayetteville, Georgia, PPS is the top plastic surgery practice for all Georgia residents. Perimeter Plastic Surgery offers a variety of services from breast augmentation and reconstructive surgery, to tummy tucks and liposuction, to injectables and physician-recommended skincare. Owner and founder of the practice, Mark Deutsch, MD, FACS, has over 20 years of plastic surgery experience, is double board-certified, and has been named a Top Doctor in Atlanta by Castle Connolly for three years in a row: 2016, 2017, and 2018. Perimeter Plastic Surgery’s Atlanta office is located in Northside Hospital’s Northside Doctor’s Center on Johnson Ferry Road. For more information about Dr. Deutsch and Perimeter Plastic Surgery, please visit https://perimeterplasticsurgery.com.